If you find yourself in a position where your home is just no longer big enough to accommodate your lifestyle, it might be time to consider a house extension. If you live in the Melbourne area, Custom Outdoor Living is here to help. With twenty years of experience, Custom Outdoor Living can fulfil all your house extension needs, from planning, designing, and building a beautiful and functional addition to your home. There are a lot of different reasons you might decide on a house extension. 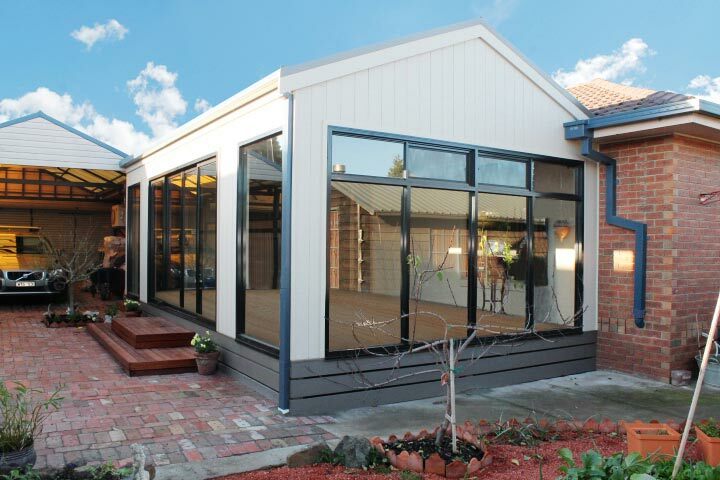 Whether it’s an extra bedroom for a growing family, a room for entertaining guests, an art studio or workshop, or just the desire for a sunroom, Custom Outdoor Living is the leading business in house extensions in Melbourne. With a quick phone call you can set up an at-home meeting for one of our team members to come by and assess your house and discuss your requirements. From there we can help you plan and design what you want your extension to look like based on what you need and the limitations of your property. With those parameters in place, you can choose to do anything. Add a wall of windows, a sliding door, a brick accent wall -whatever you like! At Custom Outdoor Living we want you to be happy with your extension. If you’re building a house extension to use as a recreational room you could fill it with all sorts of things, such as an entertainment system, an air hockey table, a pool table, and more. An art studio could be designed with large windows to let in light and a large work table for laying out tools and supplies. You could even have another bathroom added along with a new bedroom, giving the room’s occupant an extra air of privacy. After the extension is built you can then decide on the fun stuff: wall colours, furniture, art, and anything else you might want. Perhaps a new television for that rec room, or a bar set up for entertaining guests. The possibilities are endless. At Custom Outdoor Living, we want to give you the best building experience possible. We work with you to design the perfect house extension and try to make sure the building process goes quickly and with minimal disturbance to your daily life. Once the extension is done there are so many decorating and design options out there, but they all start with our quality work. If you’re in the Melbourne area and find yourself in need of more space at home, give us a call and we’ll see what we can do to help.